Every July, Dalhousie’s Halifax campuses spring to life as crowds of sunblock-slathered children descend on the university for the start of summer camp season. Meanwhile in rural Labrador, a thousand kilometres away by plane, children in small communities along the coast are taking part in some Dal-led learning of their own. SuperNOVA, the Dal-based, student-driven science and technology initiative, is running a series of outreach camps in the region this summer aimed at getting more children in these often-underserved communities engaged in learning about science, technology, engineering and math (STEM). The camps are sponsored by Actua, a national STEM outreach group with 34 member organizations across Canada that runs similar outreach activities in more than 500 communities each year, reaching 250,000 young people annually. Lauren Dickhout, this year's Labrador camp coordinator, and instructor Moustafa Esmat arrived in Happy Valley-Goose Bay — the region's largest community — early last week for the first of eight five-day science camps that will run through July and into late August. Lauren, born in B.C. and who just graduated from Dal with a degree in Recreational Therapy, has been involved in the Labrador outreach camps for two of the four summers SuperNOVA has been running them. She also spent last July and August with a team on Baffin Island in Nunavut. "I love seeing the kids in these places experience new educational things," she says. "I also love working the community members and seeing how passionate they are about putting on programs for their communities." Six of the eight communities Lauren and Moustafa will be visiting this summer are predominantly Inuit and supported by Nunatsiavut, a self-governing regional government. The remaining two camps are in predominantly Innu communities and sponsored in part by Vale, a Brazilian mining company with operations in the region. With 20-30 children (ages 7-12) signed up in each community, the camps are cosier than their Halifax counterparts and catered to local culture and sensibilities. Each spring, Actua provides training in Indigenous history and cultural awareness to instructors such as Lauren and Moustafa working in these communities to facilitate the connection between aspects of culture, traditional knowledge and modern science, says Leslie Cuthbertson, Actua's senior director of strategy and organization development. “They receive training in successful practices in engaging Indigenous communities in STEM,” she says, adding that local Elders and other community volunteers are sometimes involved in the workshops and activities. Lauren and Moustafa have a wide assortment of different activities planned for the various camps, including an exercise called ‘Protect That Pill’ where the kids learn about biochemistry and pharmacy, a glow-stick demo that teaches them how temperature affects light and molecules, and an obstacle course/blindfold group activity designed to teach kids about computer science without actually using computers. Moustafa, a fourth-year electrical Engineering student, says it is his first year working as a SuperNOVA instructor and that he's learning a lot from the experience so far, especially when it comes to translating complex science into easy to understand exercises for young kids. "You're trying to get them to learn big concepts, but at a young age. You have to really simplify it down," he says. During the computer science obstacle course activity, for instance, he says they bring the concepts down to the physical level. “When a partner touches an obstacle by mistake, their partner then tells them 'That's okay, programmers make mistakes sometimes and we've got software testing engineers and they debug problems," he explains. Lauren says it's important to ensure the references they use make sense to the kids in each community. For instance, when doing a popsicle-stick bridge-building activity in Halifax they might mention the MacKay Bridge, but in Labrador they might instead reference a stream or creek running through the community. She says an activity measuring pH levels in different liquids in a session last week turned into a lesson about the environment when some of the campers shared observations about how the liquids might impact their own lives whether it is the fish they catch or where they go swimming. By engaging kids in these topics in relatable ways now at a young age, the hope is more of them will stay interested later, says Lauren. "We're trying to bridge the gap between them thinking about the science and about the opportunities in the future for them in science." 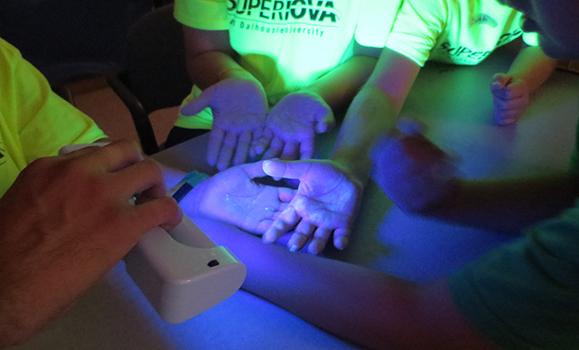 Learn more about SuperNOVA's various outreach activities at its website.